Employment First is a nationwide effort to make employment the first priority and preferred outcome in providing services to individuals with disabilities. This policy research brief by the University of Minnesota details the progress of employment first efforts across the country. 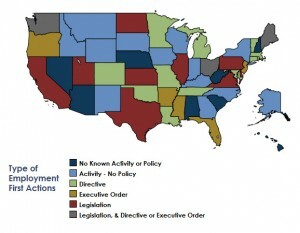 According to the brief, 30 states have taken formal policy action to prioritize employment, including directives, executive orders, or legislation. So far, Hawaii has not taken formal action as part of the Employment First initiative.